Maltese pianist Tricia Dawn Williams delighted the numerous avantgarde music enthusiasts who attended her recital at the ’Silent Green’ cultural centre in Berlin. The performance, entitled ‘Transition’, included works by Atau Tanaka, Ruben Zahra, Henry Cowell, Steve Reich, Michel van der Aa and George Crumb. Japanese composer Atau Tanaka, who was present for the concert explained some of the characteristics of contemporary music and his own compositions. 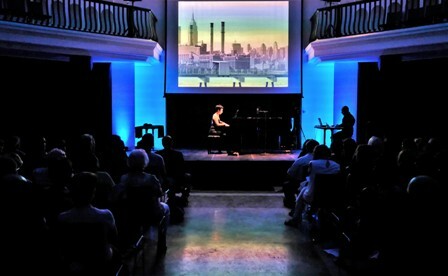 For her recital, Ms Williams used ‘motion capture image’ technology and extended piano technique as well as video art and electronic music. Music expert and interdisciplinary artist Ruben Zahra, who conceived the programme and composed one of the works, explained the pianist’s style, the idea behind each work and coordinated the video and electronic pieces which accompanied Ms Williams’ rendition. The works performed demanded an extremely high degree of concentration from the pianist and incredible dexterity as well as perfect coordination with the visuals and electronics. It was clear that the audience was highly appreciative of Ms Williams’ talent and virtuosity; many were impressed by the new ways of exploiting the diversity of the piano as an instrument. After the concert, the guests had the opportunity to meet the musicians, ambassador Dr Albert Friggieri and his wife, as well as embassy employees in the lovely café and the cultural centre’s adjacent garden. The event was organised by the Embassy of Malta in Germany and was sponsored by the Cultural Diplomacy Fund of the Ministry for Foreign Affairs and Trade Promotionof Malta.